Reinette’s career as a ceramic artist began in 1973, where she attended class at the Technical College in Brakpan. In 1979 she opened a shop in Goodwood Cape Town where she started her career and as a pottery teacher. In 1984 Reinette moved to Centurion, Gauteng and opened her studio in Wierdapark, where still teaches today. 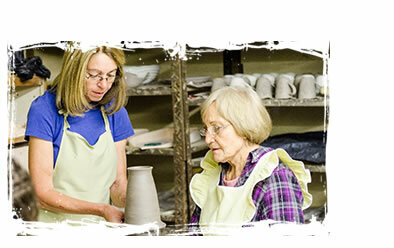 The internationally renowned South African Studio Potter; Hym Rabinowitz is one of Reinette role models. She attended several of his workshops, and has great respect for the manner in which he approached his craft and his passion for simple functional pots and decorations.